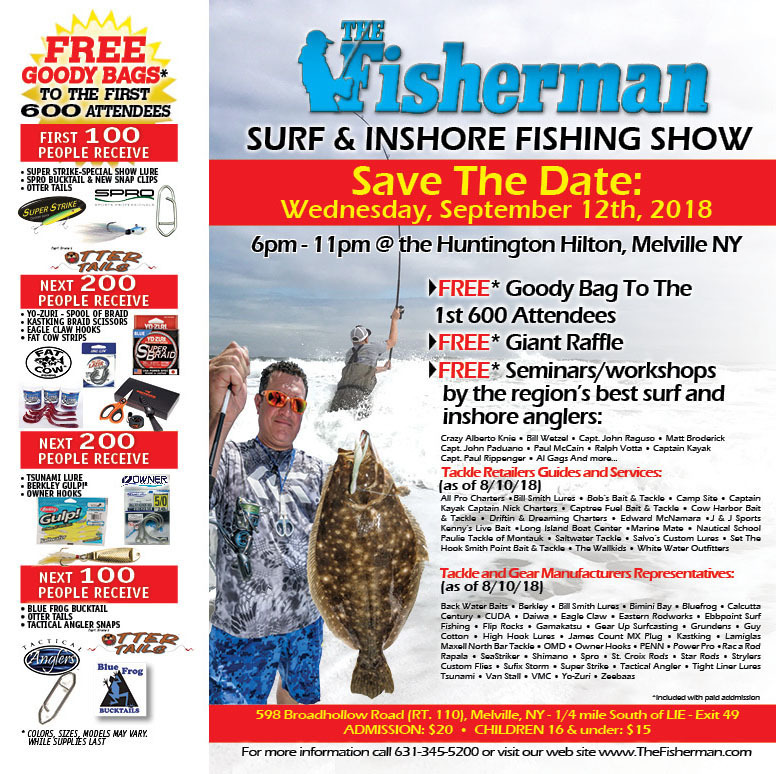 The Fisherman’s Surf/Inshore Fishing Show and Seminar is slated for Wednesday evening, September 12, at the Huntington Hilton (quarter mile south of the LIE on Route 110). More than 80 surf and inshore related tackle manufacturers and retailers will be represented, with many of the best tackle shops and tackle vendors from the region offering great deals to help get you prepared for the fall season. The first 600 attendees will go home with goody bags made up of an assortment of tackle items from Super Strike, Spro, Otter Tails, Yo-Zuri, KastKing, Fat Cow, Eagle Claw, Tsunami, Blue Frog, Berkley, Owner and Tactical Angler. Every attendee receives a free chance to a raffle featuring great surf fishing related prizes, including rods, reels and surf fishing accessories from manufacturers like Van Staal, Penn, Tsunami, St. Croix, Lamiglas, Century, Star Rods, Daiwa, Korkers, Shimano, AquaSkinz, Gear Up and many others. This year’s seminar series features an impressive array of surf and inshore fishing experts, including “Crazy Alberto” Knie on Surf Fishing Strategies, veteran surf guide Bill Wetzel on Matching Plugs and Baitfish, Al Gags of Al Gags Lures on delivering lightweight plastics and streamers with an egg rig, Matt Broderick, one of the sport’s hard fishing young guns on Fishing South Shore Inlets. Covering the inshore scene will be Capt. John Paduano on Snap Jigging And Gulping For Sea Bass and Porgies, Capt. John Raguso on Fall Wreck Fishing, and Capt. Paul Rippenger on Blackfish Tactics, while Paul McCain of River Bay Outfitters will cover Flyrodding Back Bay Stripers From Boat and Bank. You will also be able to pick the brains of experts like Ralph “The Tin Man” Votta of West End Tackle, LIBBA members who can fill you in on what you need to know for safe and responsible beach driving and permit information, Capt. Kayak on rigging out your kayak, Steve Petri of Bob’s Bait & Tackle on rod building, and Bill “Big Fischer Plugs” Fischer on fishing big plugs in the surf. please follow up & update us on Tsunami’s Salt X stainless steel gears, sealed Spinning Reels that you featured a couple of posts ago. Will Surf Show attendees be able to sign up or renew subcriptions to SurfCasters Journal?